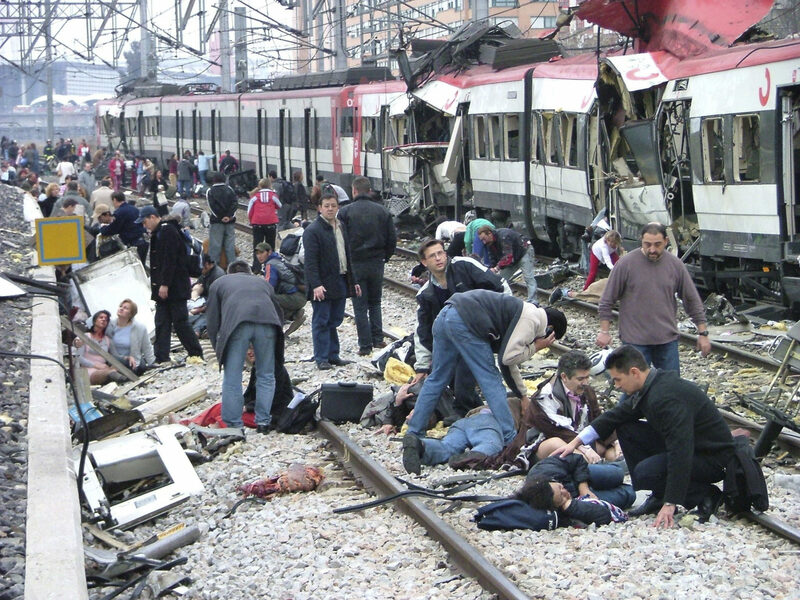 Read Claire Cozens’ Guardian article about Pablo Torres Guerroro’s photograph of the human and material destruction caused by the Madrid bombings of March 11th 2004. What would you have done had you been the editor of a British broadsheet newspaper? Unfortunately, the links in the Guardian article we are referred to for this exercise no longer work, so I have not been able to see the varying approaches of photo editors to the graphic and harrowing nature of this photograph. The piece does however detail clearly how they chose to ‘edit’ the severed limb in the picture: The Times, Daily Telegraph and Daily Mail chose to ‘airbrush’ the arm out, replacing it with stones matching those nearby, The Guardian changed the colour from red to grey which made it impossible to distinguish from the background and others, including the Daily Mirror, published the photograph in black and white to alleviate the problem. The Spanish newspaper El Pais printed the image unaltered on its front page. The decisions given for altering the image are explained as being about ‘taste’ and fear of upsetting the readership of each newspaper – the unspoken extension of this is the commercial reality that upset readers may choose to no longer buy the newspaper. No comments are made about the people that are in the image that are clearly identifiable and the ethics about showing them – it is likely that some of these have suffered life changing injuries in the attack and at the very least, will be traumatised – how would they and their families feel about being on the front pages of newspapers around the world? As I examine the picture, the most striking thing for me is the returned gaze of the man in the middle of the frame – he has a look of disbelief seemingly about both what has happened and the act of photographing the scene itself. As a viewer it makes me feel uncomfortable. I then notice another two men either side both also looking back and this feeling is compounded. The Guardian article concludes with comments by David Hockney who praises Cartier-Bresson as the “master of truthful photography” he argues that we cannot have a photographer like that now because we know photographs can be manipulated with such ease. Hockney makes the incorrect point that this lack of faith in the truth of a photograph from the audience is because of the decline in analogue photography and chemical processes. While it is true that digital processes and Photoshop make altering images much easier and more accessible, it was still possible to significantly alter a photograph in the darkroom. The important point is that it is the standard that Cartier-Bresson set for his images that is significant, because he did not even crop his photographs we can trust that they are the scene he was presented with in front of the camera. When newspapers begin to alter the images they print then they support the view that the photograph cannot be trusted – in my opinion, editors only had two legitimate choices with this image, either print fully or not at all. Part of the reason Kenneth Jarecke’s 1991 image of the charred remains of an Iraqi soldier shot at the end of the first Gulf war is so shocking is that it shows the violence of war in a way that modern audiences are no longer used to. Operation Desert Storm was a conflict that presented a sanitised version of warfare and used euphemistically bloodless language such as surgical strikes, kinetic warfare, collateral damage and smart bomb. The media output was carefully controlled by the military with grainy footage of laser guided bombs targeting buildings being the key news output – the impact was shown, but crucially, the lack of a human presence on either side gave the false impression that this was a new type of bloodless war. This focus on hardware rather than people removed empathy for the viewer, something that Jarecke believes is crucial in photography. Jarecke was embedded with the XVIII Airborne Corps for the duration of the war mainly at the Iraqi-Saudi border. Like all other journalists his movements were closely supervised by Army Public Affairs Officers (PAO) who controlled where they could go and what they could photograph, his controversial pictures of the incinerated man were taken when opportunity arose at the very end of the conflict, his PAO objected to him photographing on the grounds of taste but did not stop him. The picture shows just one victim of an estimated thousands killed by American forces as they retreated on a road that subsequently became known as the Highway of Death. While the overt censorship exercised by the army is an obvious factor about why these types of war photographs are now rarely published by the mainstream media, it is self censorship by these outlets that is the most worrying reason for them not appearing. Jarecke’s image for example was not printed anywhere in the US on the grounds of taste, something that is challenged by former freelance photo editor for Life magazine Stella Kramer who believes the decision was based less on “protecting readers than preserving the dominant narrative of the good, clean war.” (Friedersdorf, 2013) The insinuation here is that the media has become little more than a propaganda arm for the government and military. The other reality is the fear of lost readership and advertising revenue is a real concern in the highly competitive media arena and could be the strongest reason for their conservative approach.